The hills of Cappadocia were formed by meters of volcanic ash and minerals deposited millions of years ago. For thousands of years humans have carved into this soft material building shelter and churches. In fact, digging downwards, they have dug out a network of 100 cities going 8 levels down! In this image simply shows an observer finding his spirit in this so-called alien landscape. Nice pov, beautiful colors and i like the clear of face, well done. Excellent DOF and POV Dan! The colors are beautiful and I love the detail on the cloth and hat on the man's face and head. 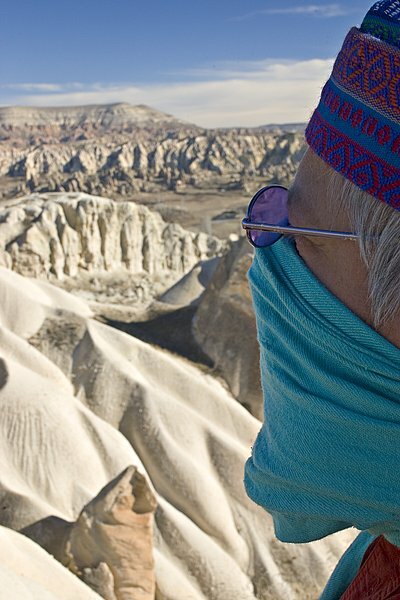 Great how he looks out on the lovely scenery of Cappadocia. Good cropping at the right side although I would recommend leaving a little more at the left to really get a sense of the vast space and natural structure he is viewing. Do nature and WOMAN not have a history??? Woops! TFS!